Jack N. Mandel, a renowned businessman, revered philanthropist and respected community leader, died May 12 at the age of 99. An innovative industrialist with his younger brothers Joseph and Morton, Jack Mandel also gave generously to support initiatives in nonprofit management, the humanities, leadership and social policy, among others. In 1953, he and his brothers created The Mandel Foundation. The foundation has been a generous supporter of Case Western Reserve, including significant grants to name the Mandel School of Applied Social Sciences and to build the new home for the Mandel Center for Nonprofit Organizations. 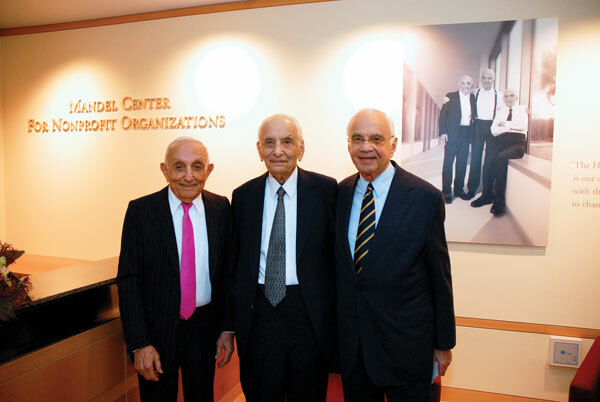 In 2007, Jack joined with his brothers to dedicate the Mandel Center building on Bellflower Road. Jack Mandel was born in Kolbuszowa, Austria (now a part of Poland), and emigrated to the U.S. in 1920. As a student at Glenville High School, he took part in half-day education and spent the rest of the day working odd jobs, including selling the Cleveland News, ushering at the Palace Theatre and die-casting at Superior Casting Co., among others. In 1940, the brothers bought their uncle’s small auto parts store on Euclid Avenue and renamed it Premier Automotive Supply Co.; 20 years later, the industrial business went public as Premier Industrial. It thrived over the years, setting earnings records nearly every year under the Mandels’ direction, including $626 million in sales in 1990. In 1996, Premier sold for $2.8 billion and became part of London-based Premier Farnell. The brothers also formed financial services companies Parkwood Corp. and the Parkwood Trust Co. in Cleveland, helped found Cleveland Tomorrow to create Gateway and revitalize downtown, and started Mandel programs around the world. Additionally, they are major funders of Neighborhood Progress Inc., which supports community development corporations, and they have invested heavily in the MidTown region of Cleveland. Mandel served as chairman of the Jack N. and Lilyan Mandel Foundation and as a life trustee of The Temple - Tifereth Israel and of the Jewish Federation of Cleveland. Mandel was preceded in death by his wife, Lilyan; their daughter, Bonnie; and an older sister, Meriam Cole. He is survived by his son Sheldon, his brothers and numerous nieces and nephews. Contributions can be made to the Jack and Lilyan Mandel Memorial Fund, The Temple - Tifereth Israel or the Jewish Federation of Cleveland. Case Western Reserve University is committed to the free exchange of ideas, reasoned debate and intellectual dialogue. Speakers and scholars with a diversity of opinions and perspectives are invited to the campus to provide the community with important points of view, some of which may be deemed controversial. The views and opinions of those invited to speak on the campus do not necessarily reflect the views of the university administration or any other segment of the university community.